This event is sold out! Thank you to all who registered!! Our next event will be on July 14th at Bowie Baysox Stadium. Please check forum for details. Our last two events have sold out! Walk-up registrations will be limited!! Registration opens 8:00 AM on Saturday, April 23rd, 2012. You can register online, ahead of time, and get a $5 discount. Online registration is highly encouraged and save you from waiting in line! Or, if it’s a last minute decision, you can still walk-up. Walk-up registrations will be for PM session only! Registration closes 12:00 PM on Friday, May 25th, 2012. See you on the 26th and thank you for autocrossing with us!! Last edited by etherpool; 05-18-2012 at 11:26 AM. I registered for both sessions. I am only classed for the morning session and put into a non-competition group for the afternoon. Will only our time for the morning count? I guess this is so we don't have an unfair advantage over single session competitors with our "familiarity" with the course? Last edited by KBH22102; 05-02-2012 at 06:25 PM. That is correct. Only your AM times will count for standing results and the afternoon will be non-competition (aka fun runs). The reason for this is that it would be very unfair for you to get 8 attempts at a course when some only get 4. To level the playing field, only your first session runs will count for standings yet all times will be reported in the results in two different sections. Only 7 spots left for morning session!! AM session is sold out!! All day or PM sessions only. 15 slots left total. So prolly no walk ups. Who is doing the course? I'll still be designing the course, I just can't get there early enough to set it up. This is pretty selfish of you to not be driving the moo-cow hatch, BOOO. Mike now you are going to have to register. I need to see how my times are now that my car is running right. Around 20 minutes ago I registered as BMWCCA member so that I can do this event, and hopefully for free. If I am now registering for the actual event on the motorsportreg website for the all day session, will it become free automatically, or should I pay the $45 now and get a refund later? Thanks! OK, so I miss running with you guys since the change for this year. I'm going to sign up thanks to the free event offer & hopefully have a slot free for this event at Waldorf. AJ, you're doing some course designing now? Looking forward to that. Cool, signed up for all day. AJ, you can drive the 'Rolla if you want. Last edited by hepcatz; 05-18-2012 at 10:07 AM. AJ, you can run my car if you want. I'm in tuner 3 AM session, #197 I think. I have issued your credit. The credit is towards one session, AM or PM, which equals out to $30. If your registering for the full day you will have to pay the $15 difference. But it's there and you can use it at checkout when registering. Let me know if you have any questions. 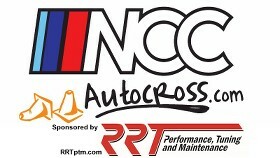 info@nccautocross.com.